Watching a big Atlantic storm roll across the ocean towards the sea-walls of Cadiz is a fine, if humbling, experience. Even standing there on a sunny day prompts a feeling of exposure, being on the edge of the solid world, knowing there is nothing between you and America but water and air. When the rain lashes and pours there seems to be nothing but water, the sea before, the lagoon behind, the rain filled air and the gushing rivulets on the flat-cobbled roads of this tiny old city. The tall buildings and narrow streets provide slim places of respite from the wind-whipped rain. Yet there are places on the grid of streets where crossing from one corner to another means a drenching – some of the streets run straight back from the sea side. On the lagoon side it is often less fierce, the town provides the shelter, but the swell still rises in the harbours. Cadiz has a unique topography, built on the rocky tip of a sand spit on the Atlantic coast of southern Spain. 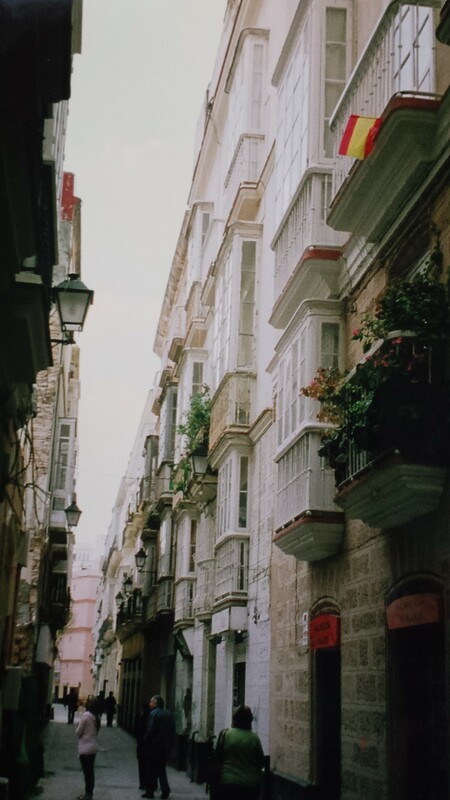 It took me many journeys and several trips to the top of the miradors, or watchtowers, which are scattered across Cadiz, before I finally set the topography of the Bay in my mind. It is half sea and half marsh and has been panned for salt since pre-Roman times, you can still see little mountains of the white mineral piled up near the railway track. Land has been reclaimed and settled, San Fernando and Puerto Real grow bigger every year. But the Bay it is still a desolate and eerie place, especially when there is a mixture of driving rain, low cloud and sea fret. On my last visit there were all three, as well as sunshine and a rainbow – the weather here is idiosyncratic too. A flight across the marshes features in one of my later Al Andalus books, the topography almost required it to be written. 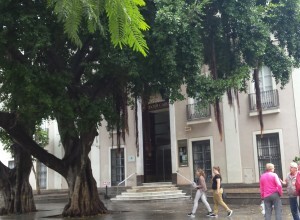 The Bay area has been inhabited since pre-history and one good thing to do on a rainy day in Cadiz is visit its excellent Museum, ( pictured left ) which contains exhibits going back to seven centuries BCE. There are some unbelievably exquisite and delicate pieces of jewellery which I, at first, mistook for something from a much later period. There are Phoenician sarcophagi and votive statues to Astarte. Melqart was a major deity here, subsequently conflated with Heracles or Hercules, and his columns form part of the coat of arms of the city. 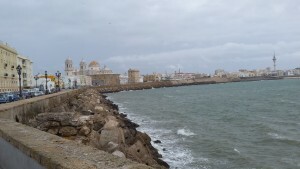 It has been called Gadir (Phoenician), Gadiera (Greek), Gades (Roman), Qadir (Arab) and Cadiz and is one of the oldest continually inhabited cities in Western Europe. So lots of history then. The second floor is a Fine Arts Museum, with pictures by Zubaran, Ribera, Rubens, van Eyck, Van der Weyden and Murillo, who died after falling from the scaffolding in Santa Catalina church on the Campo del Sur in Cadiz when painting his ‘Marriage of St Catherine’. 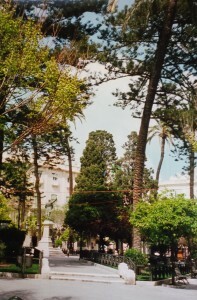 The Museum is on the Plaza Mina, one of Cadiz garden squares, often planted, like the public gardens at the very tip of the landspit, with exotic species brought back, by Columbus and others, from far-flung voyages. These are worthy of their own article. But another visit for a rainy day would be to La Casa del Obispo next to the ‘New’ Cathedral (begun 1772), which contains fine art and ceramics in a lovely period house, ( the Bishop’s House ) but also allows the visitor to walk, on glass floors, over excavated archeological sites, mostly of the Roman period. La Casa is a small, but excellent museum. Entry to the Casa del Obispo is 5 euros, it is open Monday to Sunday 10.00 a.m. until 6.00 p.m.. Admittance to the Museum of Cadiz is free, it is open Tuesday to Saturday 10.00a.m. to 8.30 p.m. and Sundays 10.00 a.m. until 5.00 p.m. ( Summer hours are different ). 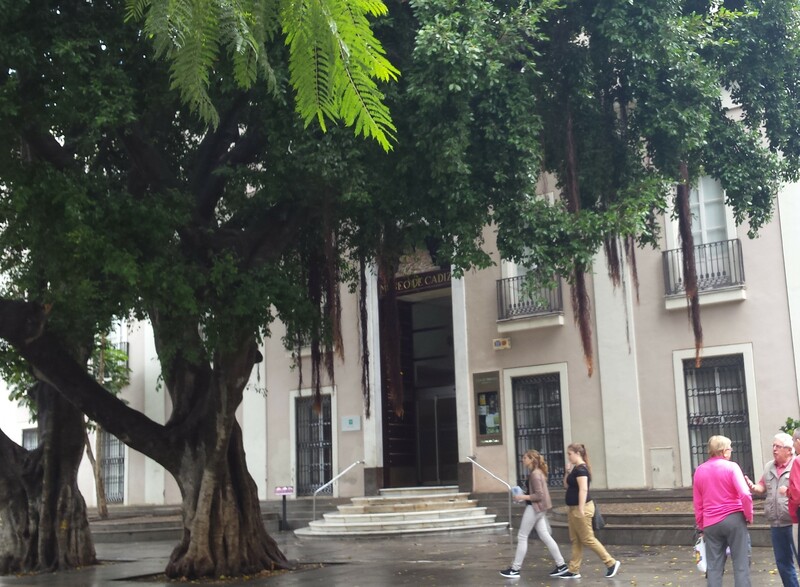 Or alternatively you could take a trip to Jerez – see ‘Jerez in the Rain’.